Even with only 28 days, somehow February can stretch from the depths of winter to very early signs of spring. In this month of contrasts, you may see bare branches or buds, hear wind or birdsong, and feel snow over your boots or meltwater seeping into your socks. It’s too early to garden in earnest, but planning time is nearly over. Outdoor gardening tasks focus on winter renewal pruning and checking for storm damage. Indoors, we are working on plant orders, data entry, and presentations. Orders for native plants through the Friends of the Arboretum advance sale are due on February 14. In addition to a wide selection of native trees and shrubs, herbaceous plants and a Pennsylvania sedge groundcover are available. Plant mixes—including edible natives, rain garden, butterfly garden, and forest garden—are offered, as well as full and half flats of popular species that are easy to grow. FOA provides plant information sheets to help you match your plant selection to your site. Most of the mixes include 32 plants, which will cover an area of about 40 square feet if the plants are spaced one foot apart. If your garden area is larger, supplement with additional species that will grow well under the same conditions. Some of these are available in the advance sale (they are noted below with an *), others will be for sale at the FOA tent sale on May 12. For example, the rain garden mix will thrive in a basin or low-lying area that collects rainwater. To enhance your rain garden mix, add prairie dropseed (Sporobolus heterolepis),* larval host for skipper butterflies; mountain mint (Pycnanthemum virginianum) and meadow blazing star (Liatris ligulistylis), nectar sources; and Joe-pye weed (Eutrochium spp. ), moth larval host and nectar source. 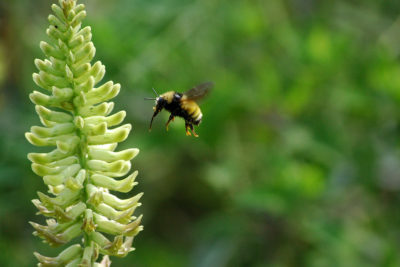 Your rain garden also supports pollinators and native beneficial insects. The Monarch butterfly habitat mix includes milkweeds (Asclepias spp.) to attract female butterflies to lay eggs on fresh foliage and provide food for the caterpillars. Because it takes the equivalent of 30 milkweed plants to produce an adult butterfly, plant at high density. While all milkweeds disperse by wind-blown seed, common milkweed (A. syriaca) also spreads by rhizome (underground stem) growth. It recently seeded into our parking circle short prairie garden, which is surrounded by asphalt and in full sun. Last season, we found 60 stems. Will it expand further next season? Adult monarchs require steady sources of nectar from late May through September. For part of this time, milkweed flowers are a rich nectar source (also visited by butterflies, moths, beetles, honeybees, and the most effective milkweed pollinator, bumble bees). Supplement the mix with purple and white prairie clovers (Dalea purpurea* and D. candida), Silphium species, Joe-pye weed (Eutrochium spp.) sunflowers (Helianthus spp. ), goldenrods (Solidago spp.) and a native thistle (eg., Cirsium discolor). Some ornamental plants can provide nectar (for example, zinnia), but to provide the best habitat in limited space, avoid plants and cultivars that have little wildlife value. Also add some grasses, such as little bluestem* (Schizachyrium scoparium) and side-oats grama (Bouteloua curtipendula), which are also host to a large number of skipper butterflies and yield seeds in early fall. Your monarch garden also supports other rare butterflies and songbirds. To learn more about native plants this year, visit the Arboretum gardens, take a class, or join a garden tour. As you plan, plant, and learn in your garden this season, share native plant discoveries, gardening techniques, and your questions, observations, successes, and challenges with us—as well as with friends, neighbors, and especially young families and children. In this way, you and your native plant garden can tell essential stories of restoration and conservation.